As if the vampire genre hasn’t exhausted the cinema, the self-described “Iranian Vampire Spaghetti Western” A Girl Walks Home Alone at Night is a fright flick worth experiencing. Ana Lily Amirpour is an Iranian-American film director, screenwriter, producer and actor known for her first feature film “the first Iranian vampire western.” The film made it’s debut at the Sundance Film Festival in 2014, and it’s based on the short film she wrote and directed by the same title which won “Best Short Film” at the 2012 Noor Iranian Film Festival; she describes the film as more John Hughes than horror. Think Only Lovers Left Alive or Let the Right One In to add to the stylistic library of vampire moderns. The film follows the lonesome footsteps of a vampire known as “the girl” who sleeks through the night in the Iranian ghost town known as “Bad City” looking to quench her thirst…occasionally surfing the streets on her skate board and listening to ’80s Euro-Pop. Shot near Bakersfield, Calif., but with dialogue entirely in Farsi, the film takes place in a fictional Iranian setting, identified in subtitles as Bad City, a desolate wasteland with a body count. The black-robed heroine is an avenger of the night who doesn’t take kindly to bad guys; she is first introduced by feeding upon an abusive pimp who has thrown his prostitute out of his vehicle. “I’ve done bad things,” she tells Arash (Arash Marandi), a young, James Dean-esque man she meets as he’s coming home from a costume party conveniently dressed as Dracula. Too high on ecstasy to walk home, she helps him to her home on her skateboard where they listen to electro-pop music, barely speak a word and share one of the most simplistic yet fully emotional scenes in recent cinema. Ana Lily Amipour may not receive many accolades for her work, some argue the characters are too thinly drawn, but the film presents an aesthetic reminiscent of so many styles and genres yet manages to feel completely fresh. 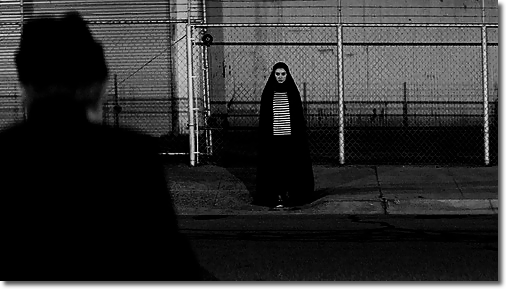 Fascinating in style and chilling in content, A Girl Walks Home Alone at Night will be making many top 10 lists for 2015. Great review! This is one I’ve been meaning to watch for a while now. It’s amazing how strong the vampire genre is right now. Thanks, Ryan! I’m surprised the genre continues to do so well with indies! For sure. It’s great time to be a horror fan with the VOD market dishing out so much quality stuff. Thanks, girl! I think you’ll really like it…can’t wait for your review! Great review! This one has been on my radar for awhile. I hope to see it eventually. Definitely check it out! It’s on Netflix! I just watched this last week and it cracked my top 10 list for 2014. I loved the atmosphere and the deliberate pace. I also don’t typically like vampire movies (or zombie) but this one combined w/ elements of the 50’s and 80’s came together and worked beautifully. I liked the part where he touched her and said “You’re cold” and then gave her a delayed hug to warm her up. It was poignant and mysterious at the same time b/c you wondered if she would harm him, or if she could discern his authenticity. 50s and 80s for sure! Thanks! Great review, I really can’t wait to see this one! Lovely review! Need to check this one out. Finally seen the film, such a great movie and a lovely write up! Thank you!! Glad you got to see it; it’s great!